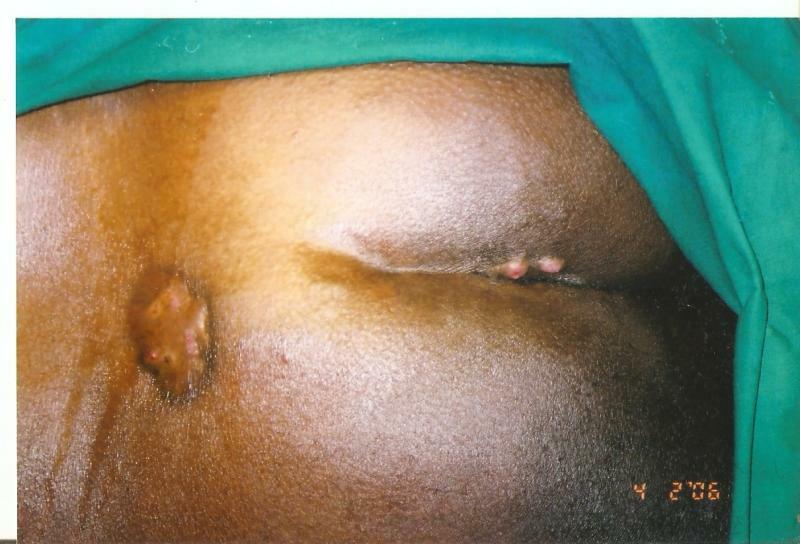 A pilonidal sinus is a small hole or tunnel in the skin, usually at the very top of the cleft between the buttocks. Dents or pits in the skin can easily become filled with bits of skin and hair, and infected with bacteria. If the dent becomes blocked, it can get bigger, eventually forming a tunnel under the skin, filled with pus. This is known as a draining sinus or abscess. If you have pilonidal dents in your skin but no symptoms, treatment is not required. To avoid infection, keep the area clean, and dry well after washing.When symptoms develop quickly and severely, in an acute infection, you will usually need an emergency operation to puncture (make a hole in) and drain the sinus of pus. For infections that keep coming back, you will need an operation. For immediate relief while waiting for your surgery (as this is not an emergency operation), you can soak the area in warm water and take painkillers such as ibuprofen, which will also help ease the swelling. If you have a lot of hair in this area, it is better to remove some of the excess, without causing further infection.